... a relatively new, developing nation evolving with and within an ancient one with a diverse, majestic natural environment and dynamic lifestyle. 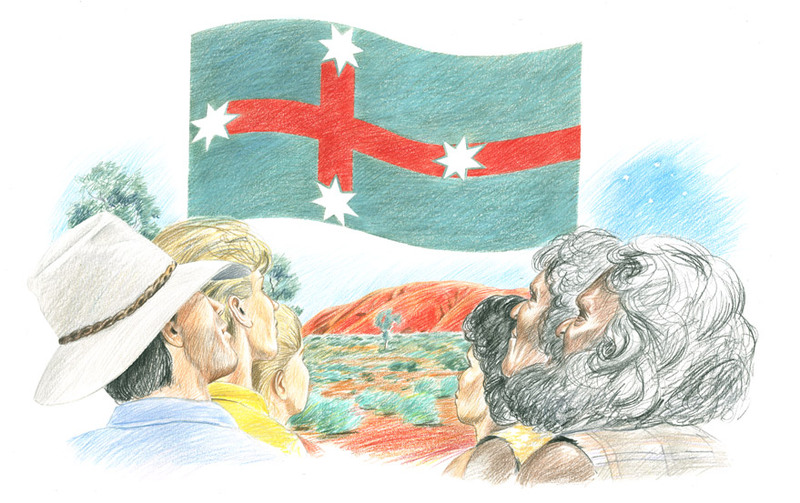 Australia... vibrant, free and extraordinary, yet with a unique ambivalence toward its culture and identity. Australia is somewhat of a self conscious youth, needing just a little encouragement, a ‘catalyst’as we are willing and have been ready for quite some time, to leave the house! Design Australia… design from the heart, from its heart, spiritually, metaphorically and literally. Create a national symbol that acknowledges our indigenous and non-indigenous peoples, our unique island continent, it's central heart, landscape form & colours, position in the world and fully projects our character, spirit and soul! The thing that allows men to never talk, to know next to nothing about each other, yet to know, with certainty, that they love each other. An American friend tells me ~ you put yourself down in the States, and everyone pets and reassures you. Put yourself down in Australia, and people know you are joking. White sand on the beaches, Red sand inland – for Europeans, both of them come as a shock. For Australians the colours glimpsed from an aircraft are like a welcome home flag! Soul Intent... a fledgling organisation intent on growth, collaborative in stimulating and maintaining healthy change and a positive, continual state of flux and progress ... much like Oz ! A direct correlation between the quality of design and the effect of its communication.